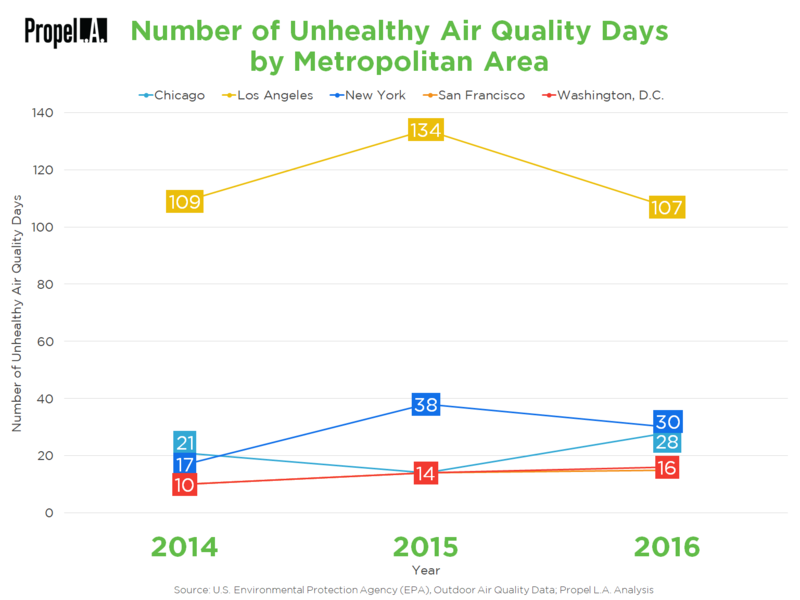 Number of Unhealthy Air Quality Days by Metropolitan Area | Propel L.A. The Environmental Protection Agency (EPA) utilizes the Air Quality Index (AQI) to report daily air quality. The AQI reports how clean or polluted the air is in which a lower number indicates cleaner air while a higher number indicates more polluted air. Among the top five metropolitan economies in the United States, the Los Angeles region has the most polluted air for consecutive years. In 2014 and 2016, the number of unhealthy days in the Los Angeles metropolitan area alone surpassed the cumulative number of unhealthy days across the other four metropolitan areas. Note: The top five economies by gross regional product (GRP) in the United States are respectively the following: New York–Newark–Jersey City, NY–NJ–PA; Los Angeles–Long Beach–Anaheim, CA; Chicago–Naperville–Elgin, IL–IN–WI; Dallas–Fort Worth–Arlington, TX; and Houston–The Woodlands–Sugar Land, TX.